Abstract. To control severe air pollution in China, comprehensive pollution control strategies have been implemented throughout the country in recent years. To evaluate the effectiveness of these strategies, the influence of meteorological conditions on levels of air pollution needs to be determined. Using the intensive air pollution control strategies implemented during the Asia-Pacific Economic Cooperation Forum in 2014 (APEC 2014) and the 2015 China Victory Day Parade (Victory Parade 2015) as examples, we estimated the role of meteorological conditions and pollution control strategies in reducing air pollution levels in Beijing. Atmospheric particulate matter of aerodynamic diameter ≤ 2.5µm (PM2.5) samples were collected and gaseous pollutants (SO2, NO, NOx, and O3) were measured online at a site in Peking University (PKU). 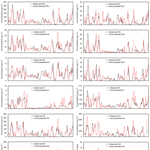 To determine the influence of meteorological conditions on the levels of air pollution, we first compared the air pollutant concentrations during days with stable meteorological conditions. However, there were few days with stable meteorological conditions during the Victory Parade. As such, we were unable to estimate the level of emission reduction efforts during this period. Finally, a generalized linear regression model (GLM) based only on meteorological parameters was built to predict air pollutant concentrations, which could explain more than 70% of the variation in air pollutant concentration levels, after incorporating the nonlinear relationships between certain meteorological parameters and the concentrations of air pollutants. Evaluation of the GLM performance revealed that the GLM, even based only on meteorological parameters, could be satisfactory to estimate the contribution of meteorological conditions in reducing air pollution and, hence, the contribution of control strategies in reducing air pollution. Using the GLM, we found that the meteorological conditions and pollution control strategies contributed 30 and 28% to the reduction of the PM2.5 concentration during APEC and 38 and 25% during the Victory Parade, respectively, based on the assumption that the concentrations of air pollutants are only determined by meteorological conditions and emission intensities. We also estimated the contribution of meteorological conditions and control strategies in reducing the concentrations of gaseous pollutants and PM2.5 components with the GLMs, revealing the effective control of anthropogenic emissions. 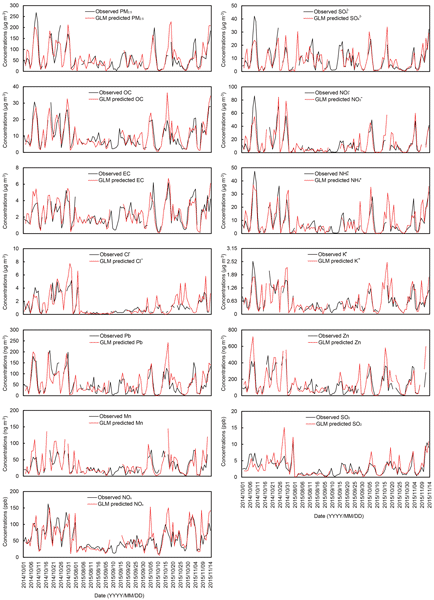 How to cite: Liang, P., Zhu, T., Fang, Y., Li, Y., Han, Y., Wu, Y., Hu, M., and Wang, J.: The role of meteorological conditions and pollution control strategies in reducing air pollution in Beijing during APEC 2014 and Victory Parade 2015, Atmos. Chem. Phys., 17, 13921-13940, https://doi.org/10.5194/acp-17-13921-2017, 2017. The generalized linear regression model (GLM), even based only on meteorological parameters, could be satisfactory to estimate the contribution of meteorological conditions in reducing air pollution and hence the contribution of control strategies in reducing air pollution. Using the GLM, we found that the meteorological conditions and pollution control strategies contributed 30 % and 28 % to the reduction of the PM2.5 concentration during APEC 2014 and 38 % and 25 % during Parade 2015.